Legends of Tuareg music, Tartit step straight out of the Sahara. With their traditional Instrumentation and repertoire, their music seems deceptively simple, yet speaks directly to the issues of today seeking to preserve a culture under attack. Nomads by tradition, the pressures of politics, modernization and climate change threaten their very existence. One of the original groups to perform on the stage of the legendary Festival au Desert in Mali, Tartit were one of the last to perform as the 2012 edition ended two days before chaos of rebellion and fundamentalist takeover descended into their desert. Now refugees in neighboring countries, the group are a beacon to the Tuareg people around the world. This iconic group is led by Fadimata Walet Oumar, known as Disco. 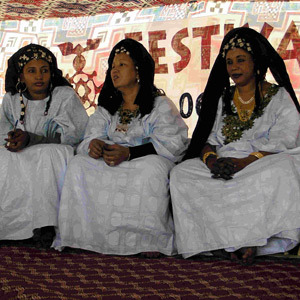 Popular at celebrations throughout the Tuareg world, Tartit champion their culture and region which today is in crisis.